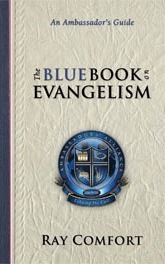 In The Blue Book on Evangelism, you will find more than 140 questions and answers about the most important of topics. Originally written as an exclusive primer for graduates of the Ambassador’s Academy, this book is now also available to the general public and will help you boldly proclaim the gospel to a lost and dying world. Take a Sneak Peek here (pdf file).